October is mission month and bishops have welcomed this year’s mission message from Pope Francis: Missionary Church, Witness of Mercy. There are almost 1,200 Irish missionaries serving throughout the world. 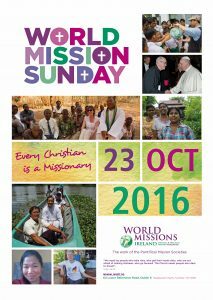 The theme for Mission month, and for World Mission Sunday on 23 October, is ‘Every Christian is a missionary’. This Jubilee Year of Mercy marks the 90th anniversary of the first World Missionary Day which was approved by Pope Pius XI in 1926 and organised by the Pontifical Society for the Propagation of the Faith. On Saturday 22 October, on behalf of World Missions Ireland, Archbishop Kieran O’Reilly of Cashel & Emly will lead the inaugural ‘Miles for Mission’ walk in Phoenix Park, Dublin, to raise funds for the Love and Hope Centre for people living with HIV/Aids in Nakuru, Kenya. Bishops ask the faithful to support the country-wide collection for our missionaries which will take place on World Mission Sunday on 23 October.